All India Yoga Shiksha Shivir (Medium- Hindi) was held at Sri Ramkrishna Mahasamelan Ashram Nagadandi under the Aegis of Vivekananda Kendra from 20 to 29 June 2016. Nineteen participants from Six different states viz, Andhra/, Telangana, Gujarat, Madhyapradesh, Maharastra, Rajasthan & Tamilnadu reported on 19th and same day the Shivir started with the Introductory session, wherein the participants were given the guidlines of the Shivir. 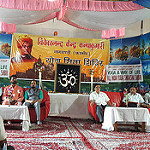 On 20th morning, Shivir was started with inaugural lecture on “Concept of Yoga” by Mananeeya Rekhadidi, the all India Joint General Secrestary of Vivekananda Kendra.The 19 participants were organized into four different Ganas (groups) – Agastya, Kashyap, Lopamudra and Gargi – Name of the Rushies. The 10 days Shivir had daily routine from 0430 to 2200 hrs Pratahsmaran & Gita-Pathan, Yogabhyas & Pranayam (moring & evening), Shram-Samskar, two Lecture sessions, Manthan, Geet-Abhyas, Pranayama and Aumkar Dhyan (Meditation) classes, Bhajan Sandhya, and concluded with Ananda Mela. The lecture sessions were on the topics of: Concepts of Yoga, Rajayoga, Bhaktiyoga, Janayoga and Karmayoga, Bharateeya Samkriti, Concepts of Dharma, History of Kashmir, Meaning of Kendra Prarthana, Shrimad Bhagwad Geeta, Maneeya Eknathaji, Swami Vivekananda, Story of Vivekananda Rock Memorial, Challenges and Response, Vivekananda Kendra-Concept and its activities. During Manthan Participants discussed over different Chapters from Sadhana of Service, Yam-Niyam and Bharatiya Samskriti. During Shram-Samskar, participants took care of the cleanliness, arrangement and management of the premises, accommodation, class rooms, dining hall, Plantation of new flower garden in ashram, work in apple garden and Guashala displaying team-spirit and selfless service. During the Camp, Participants visited Kokarnag, Verinag, Martand Sun Temple, Achhabal Garden. The Shivir went on well in a congenial, spiritual atmosphere with self discipline. The camp was concluded on 29th with one public function where Shri Lawey MP - Rajyasabha; MLA from local Surrender Ambadar - Jammu BJP and Shri Gulzar Wani - Congress were present as a guest. The program was also attened by locals. Shri Abhay Bapatji, Maharastra Prant Pramukh, Shri BL Bhat- chairman of Sri Ramkrishana Mahasammelan Ashram also were present. Many of the participants have expressed their willingness to devout their time and energy for the Service of the society through Vivekananda Kendra. Few enrolled as Patrons thus joining the large family of Vivekananda Kendra.